So much new stuff today! I forgot something though. 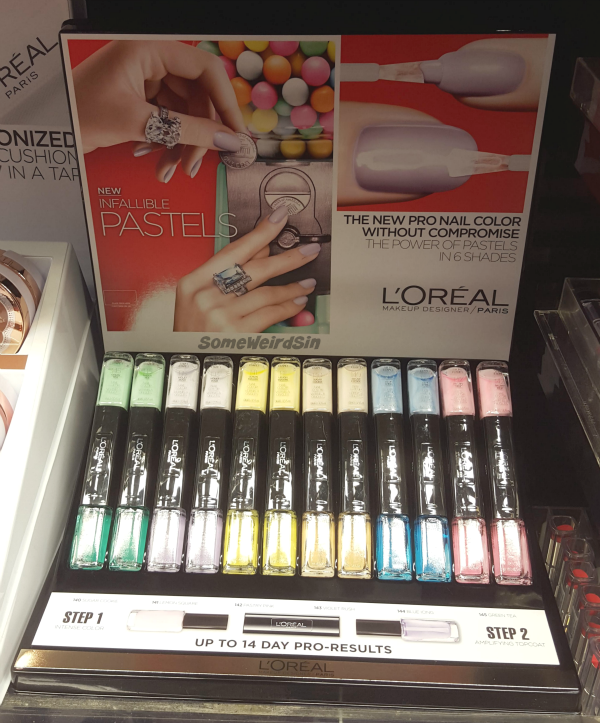 Revlon Untamed has finally turned up in the core display, but I derped and didn't get a photo. 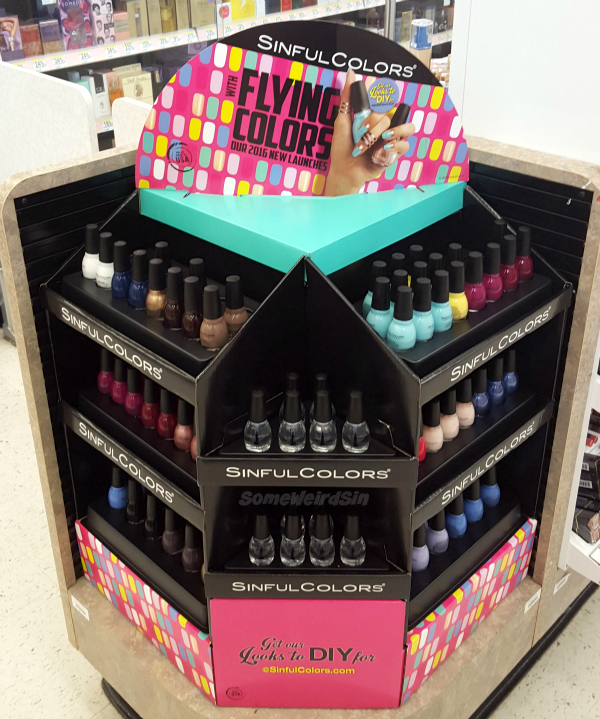 If you've been looking for it, check your CVS Revlon wall display. There's a lot to show you and a bunch of sales, so let's get to it! CVS - ExtraBucks Galore! 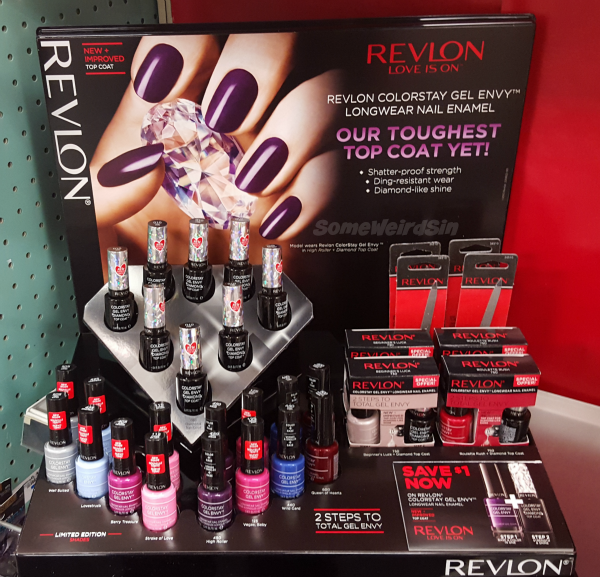 $2 EB when you buy 1 Wet n Wild Wonder Gel (limit 3), $5 EB on $15 NYX purchase (limit 1), $3 EB for a $10 Revlon purchase (limit SIX!! ), and more. BOGO50 on CoverGirl eye and all Milani. BOGO75 on Physicians Formula. Rite Aid - BOGO50 on Almay, Maybelline, L'Oreal, Revlon, and CoverGirl. $5 Plenti points for $15 CoverGirl purchase. Walgreens - 50 Everyday Points per dollar on purchases of $10 or more through 2/27, with coupon and card. BOGO50 on select Jordana, Revlon, Covergirl, L'Oreal, and Maybelline products. 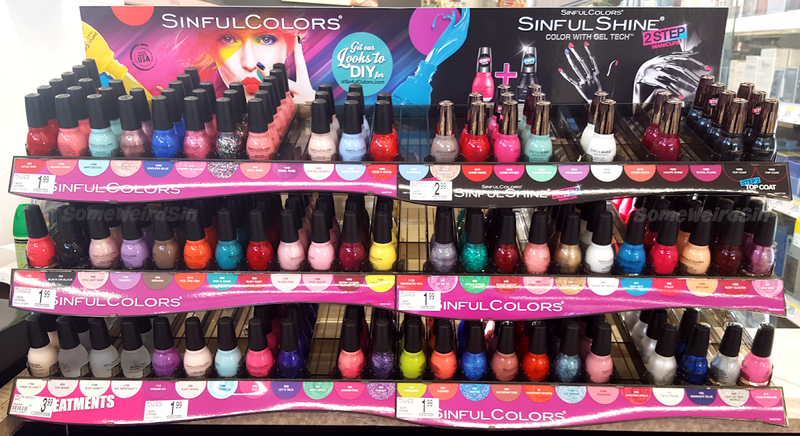 $2 off Sally Hansen Miracle Gel. Sinful Colors hasn't tied its collections to OPI's in a while, right? 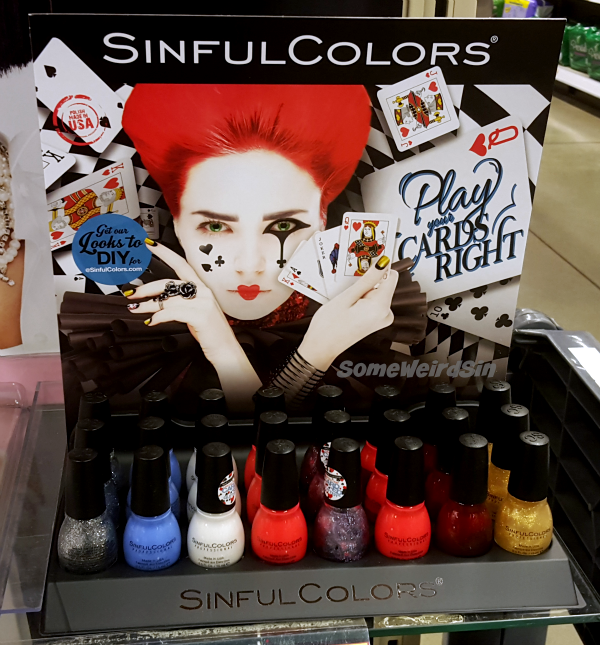 They're back at it with a strong nod to OPI's upcoming Through The Looking Glass collection. I found this Play Your Cards Right display at a local Wegmans. 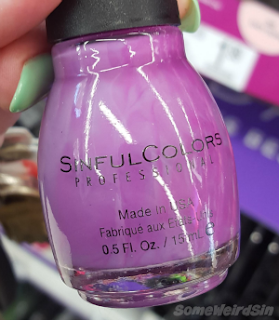 It's not up on the Sinful Colors site yet, but I'd assume it'll be in all of the usual places, possibly with a few extra shades for the Walgreens version. Time will tell. The only new shades here are Trump Card, white with gold microfleck, and I'm All In, which has card suit glitter (the diamonds are black...oops) and a strong dose of microfleck in blue and purple. Glorious, isn't it? Looks so much better than the old plexi ones. I might do an in-depth post about the new display...maybe. There have been a ton of changes. I listed most (all?) of the outgoing shades in a previous Shopper here. I haven't bought any of the new shades yet, but I'll probably grab a bunch during the next sale. It's gotta be soon, right? The last one was in...October? September? Something like that. 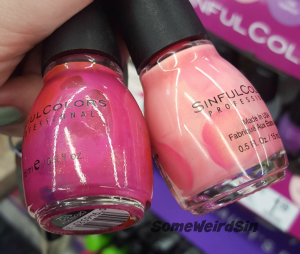 These are both Cream Pink!? This display is LE, but most or all of the shades that are supposed to be in it are in the updated core display. I'm not sure what happened at this local store, but half of these aren't really in this collection. Looks like the Gel Envy line has gotten an update. The display says the shades are LE, but I feel like I've seen a couple of them before. Thoughts? Oh boy...more of these. In pastel. Joy. Always cool to see lip palettes from drugstore brands...just wish the colors were more interesting. 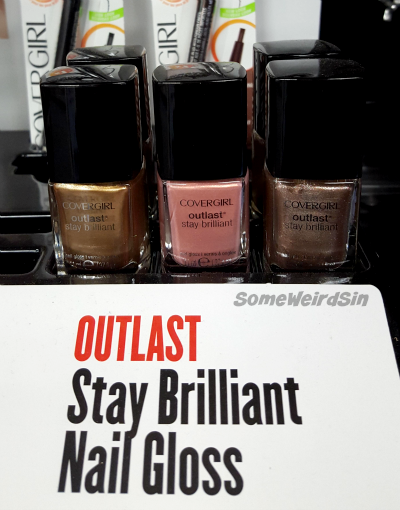 CoverGirl seemed like they were backing out of the nail polish business again, but maybe not. Three new core shades will be added to the wall display...down at the bottom...where no one is gonna see them. Triple Shine didn't last long did it? 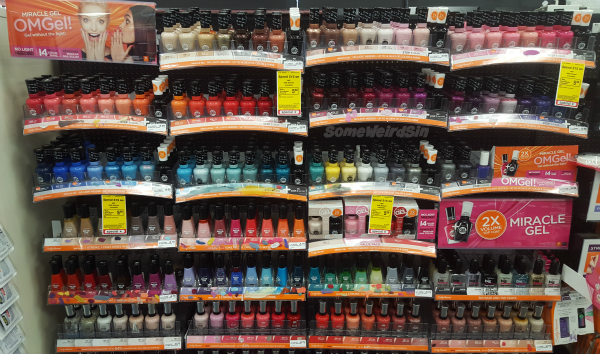 The new Sally Hansen core display at CVS is aaallll about the Miracle Gel. THREE ROWS of it! I guess all of those new shades really were core. It feels really good to write one of these again...but man I miss swatching! I have to get a preliminary thing before I can have surgery. That's coming up on the 25th. I'm hoping to be over all of this in time to swatch the hell out of the summer collections. Until then, the semi-hiatus rolls on.